At xltrail we talk to a lot of Excel users. When we ask them about their biggest Excel pain points, one of the things we hear most often is that they have a collaboration issue. This guide will show you how each option works and point out the strengths and limitations of the different approaches. Shared Workbooks have been around for a long while. 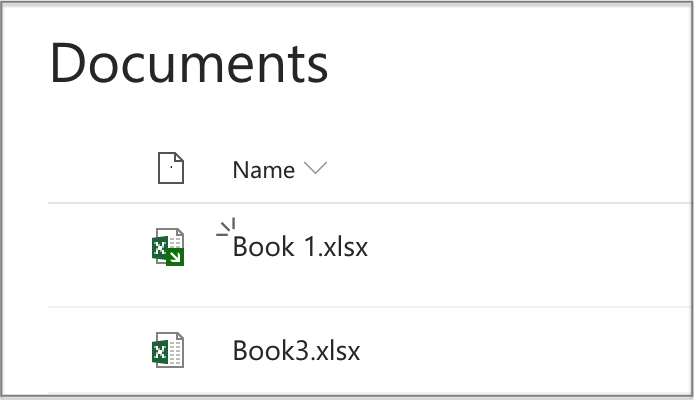 However, with Excel 2016/Office 365, while still usable, they are now officially legacy and have been replaced by co-authoring (see next section). It’s still worth to see how they work and what the limitations are which eventually caused Microsoft to abandon them. 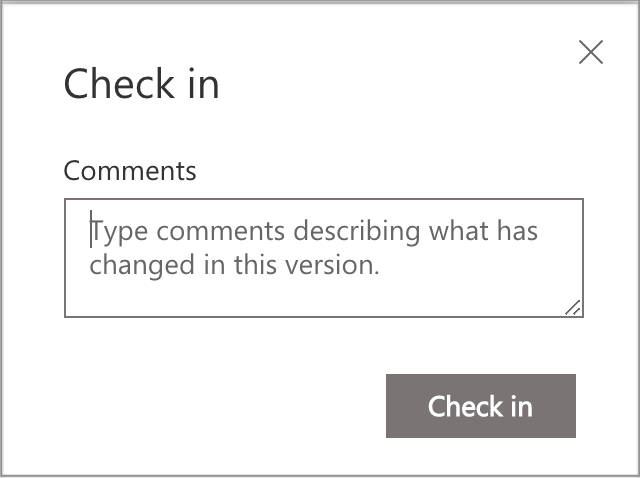 Up to Excel 2013, these buttons are available out of the box under the Changes group on the Review tab in the ribbon. 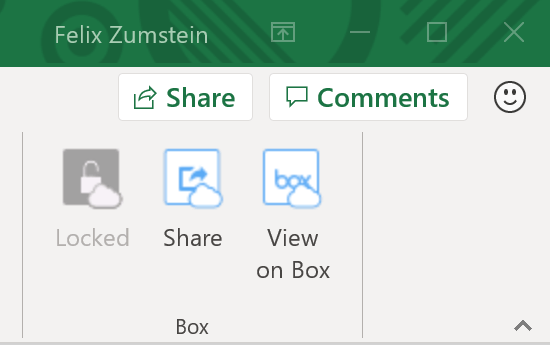 After making it a shared workbook, Excel will mark it as Shared after the file name in the title bar. You should save your shared workbook on a shared network drive so everybody can access it at the same time, but you could also send around copies by email and then manually merge in changes from these copies later on (via the Compare and Merge Workbooks button). Note that for this to work, the workbook needs to be shared before sending around copies. 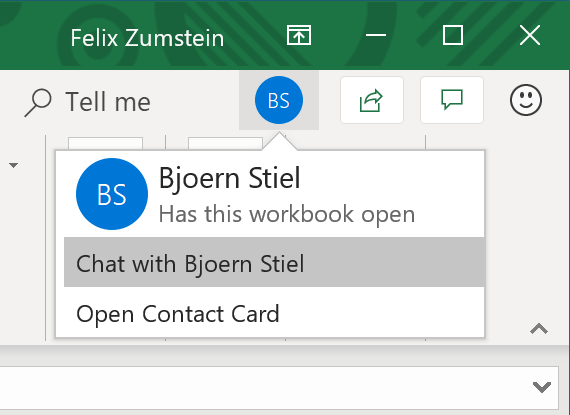 The behavior of a shared workbook differs from a standard workbook on a network drive as follows: If a standard workbook is being opened by 2 people at the same time, then the second person will get a File in Use pop-up warning and has the options to either open it read-only or receive a notification when the file is no longer in use (see also below in section Shared Network Drive). You want to make sure to also click on the Protect Sharing button in the Quick Access Toolbar and activate the Sharing with track changes checkbox so that it records the history, see below. 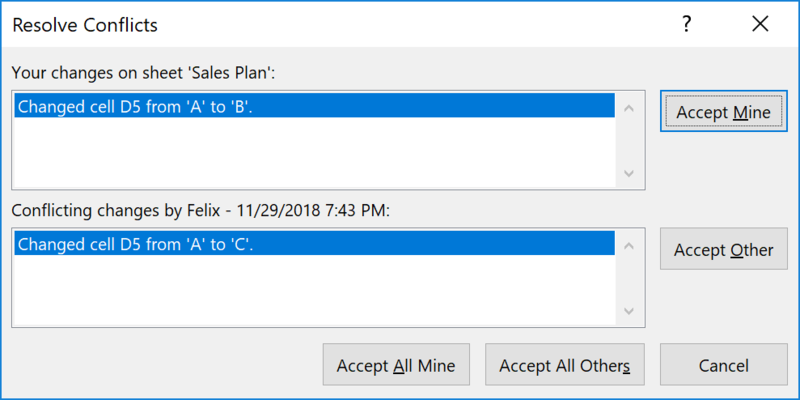 While it’s easy to click on Accept Mine, this will cause the other person’s change to revert back with the pop up Your workbook has been updated with changes made by others. However, this subtle message might bring loads of other changes at the same time and hence it might not be noticed at all by user 2 that his/her change has just been reverted. While user 2 could review every single change cell by cell, it’s a very tedious task. Once shared, you can’t use a whole bunch of items or actions (they will be disabled) like: Creating/changing charts, deleting sheets, changing/deleting array formulas, inserting/deleting blocks of cells, adding/changing conditional formats etc. For the full list, see the docs under Additional information > Unsupported features. Changes that you make to cell contents are tracked, but other changes, such as formatting changes, are not tracked. The history of tracked changes is stored within the workbook which means that the longer the history, the bigger the Excel file. To keep the Excel file in a manageable state, Excel defaults to 30 days of history (this can be changed to a very high number though). 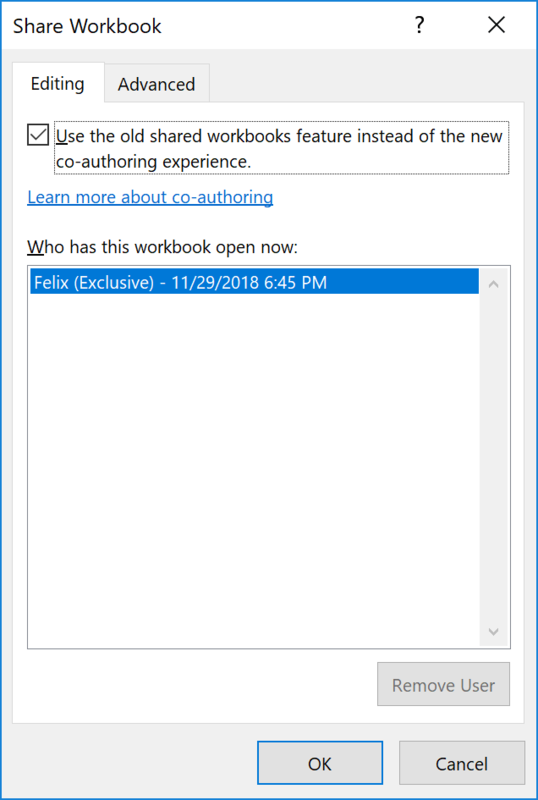 Shared workbooks are nice because they are supported by most versions of Excel and work on your own infrastructure with your shared network drive. They certainly have their use case, e.g. it’s great if various department heads need to fill in numbers on an accounting sheet. It’s pretty useless though for spreadsheets that are still being developed and heavily refactored as the restrictions (like not being able to add charts or delete sheets) are simply too limiting. Also, the change history gets quickly very noisy as it’s just a long list of actions without the possibility to group a set of changes into logical steps with an explanation of what happened (e.g. “added a new column for next year”). Co-authoring is Microsoft’s answer to Google Sheets and (at least officially) the replacement for shared workbooks. When you co-author, multiple users can open and work on the same Excel workbook and see each other’s changes instantly. Like with Google Sheets, this functionality requires you to save your workbooks in the cloud (in the Microsoft world that means either on OneDrive, OneDrive for Business or SharePoint Online). Note that the on-premise version of SharePoint is not supported. This fact alone is probably stopping many companies from accepting co-authoring as the replacement for shared workbooks. 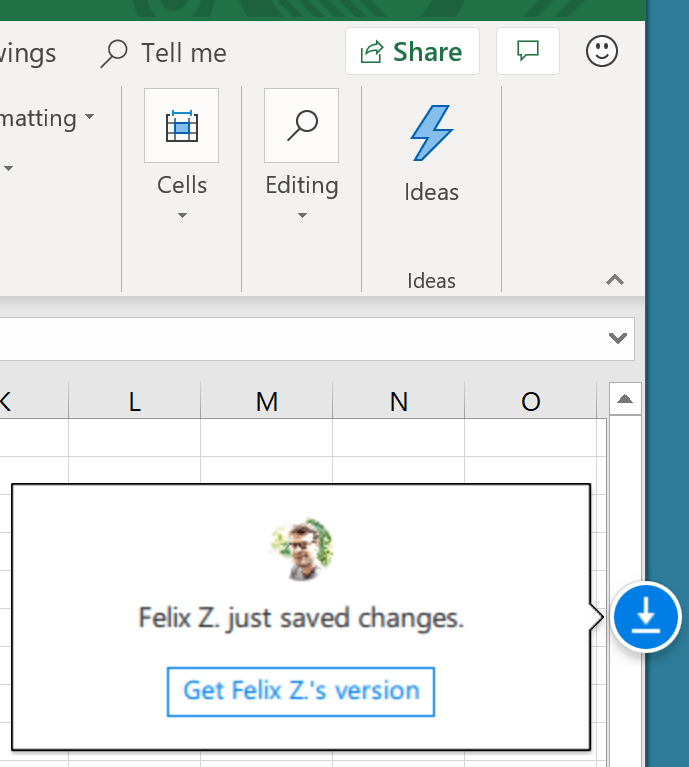 Compared with Google Sheets, Excel co-authoring has one advantage though: It also works with the locally installed versions of Excel on your desktop, not just with Excel online. On the other hand, it doesn’t offer a version history like Google Sheets does. Finally, to be able to co-author, you need to have an Office 365 subscription. This allows Excel to show the cursors and changes of the other users in real time. It might force you to change existing habits though: You can’t just open an Excel file, play around, and close it again without saving. With AutoSave turned on, the Save As... is also replaced with a Save a Copy. Here’s another example that makes AutoSave behave awkwardly: If you filter rows (let’s say to only show tasks in a list that affect you) then everybody else will get the same filters applied (Google Sheets offers Filter Views to get around that issue. Microsoft has accepted this as a feature request, but without providing a timeline yet). 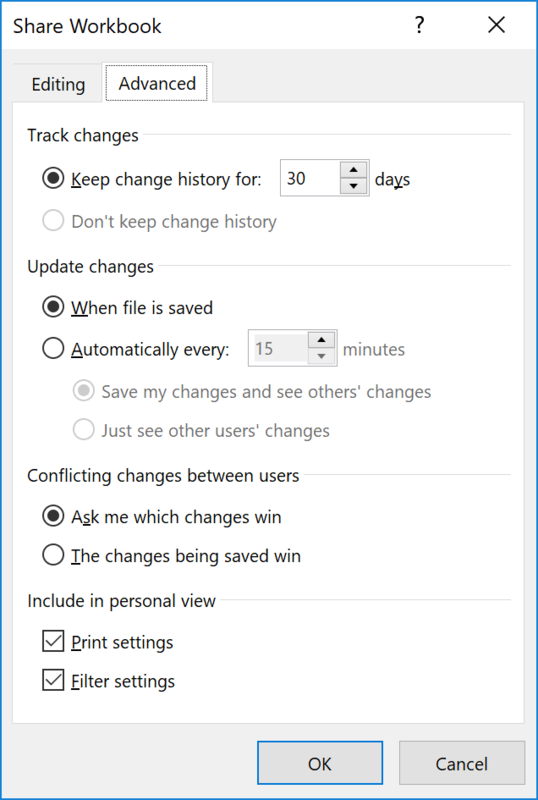 To work around this, you can switch AutoSave off (this also brings back the Save as... option) and Excel will actually remember your choice when you open the file next time. This, however, will only sync your changes with the others when you manually save the file, making it behave similar to shared workbooks with the caveat that it’s much harder to keep track of what’s going on as track changes/resolve conflicts are not available. Files need to be stored in the cloud, i.e. on OneDrive, OneDrive for Business or SharePoint Online. SharePoint On-Premise is not supported. Requires an Office 365 subscription. Requires the latest version of Excel for Office 365. No conflict resolution. In general, the change that was saved last, wins. Track changes is not possible. Co-authoring with AutoSave might require a change in the workflow as you can’t close a workbook without saving anymore. If you love Google Sheets’ real time editing experience but prefer to work with Microsoft Excel, co-authoring is for you. It’s great that it works on any device, including Windows, Mac, Office Online and Mobile apps. It has similar use cases like we saw for shared workbooks, but then again it might require you to change your workflow as everything is synced in real time to all the other users. While a shared network drive works great together with shared workbooks as seen above, it is probably also one of the oldest ways of working on standard (non shared) workbooks with multiple people via file locking. You can either open it read-only or Excel can notify you when the other person has closed the file again and it’s your turn to edit it. No built-in content versioning, but depending on how the shared network drive is setup, you might be able to right-click on the file and restore (a few) older versions by selecting Restore previous versions. Working with a non-shared workbook on a shared network drive is quite possibly the most simple way of working on the same workbook with multiple people without having to accept any of the limitations as we face them with shared workbooks and co-authoring. File locking ensures that changes by multiple users are done sequentially so we don’t risk that somebody overwrites changes from somebody else. File locking also means that we don’t have to resolve conflicting changes. 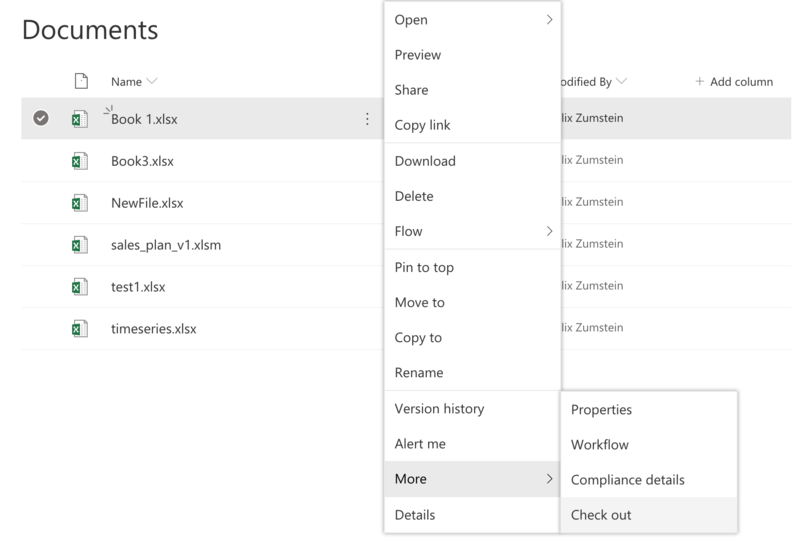 We have already seen how you can use co-authoring on files that are stored on SharePoint online. There is, however, another way of collaborating with multiple users on Excel files stored on SharePoint: The check-out/check-in workflow. Unlike co-authoring, SharePoint’s check-out/check-in feature requires you to edit the file one after another but importantly, it also works on SharePoint servers that are installed on premise, on your own infrastructure. Checking out an Excel file from SharePoint means that nobody else can edit it during this time, i.e. the effect is the same as the file locking we saw with shared network drives in the previous section. If somebody forgets to check the file back in, it can be checked in by somebody who has Full Control permissions. 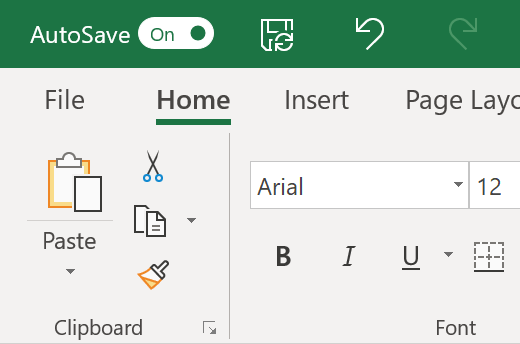 Now you can click the 3 dots again and then Open > Open in Excel or Open in Excel Online to edit the file. 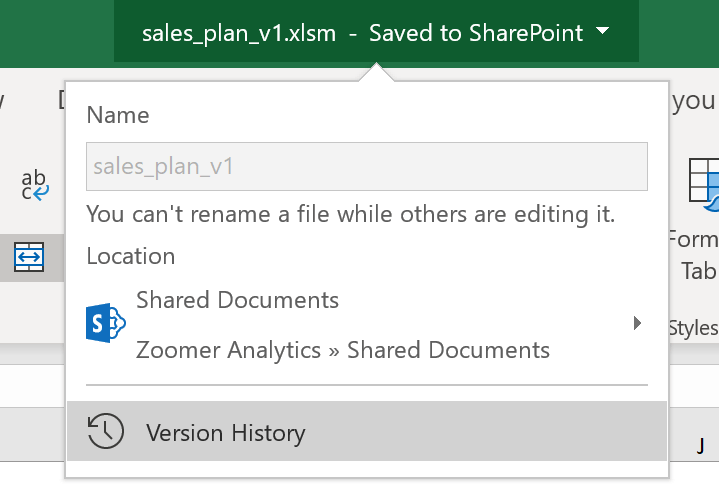 Once you’re done, save it, go back to SharePoint and check the file back in by clicking the 3 dots, then More > Check in. Alternatively, if you want to throw away your changes, you can also select Discard check out instead. To simplify the check in workflow, you can also simply close your workbook and Excel will ask you if you want to check it back in. Compared to a bare bone shared drive, SharePoint offers roughly the same features. However, the ability to create a meaningful version history with change comments makes it a lot easier to keep track of who changed the file and why. Dropbox and Microsoft have been working together since 2014 and that’s why Excel and Dropbox integrate quite nicely nowadays. 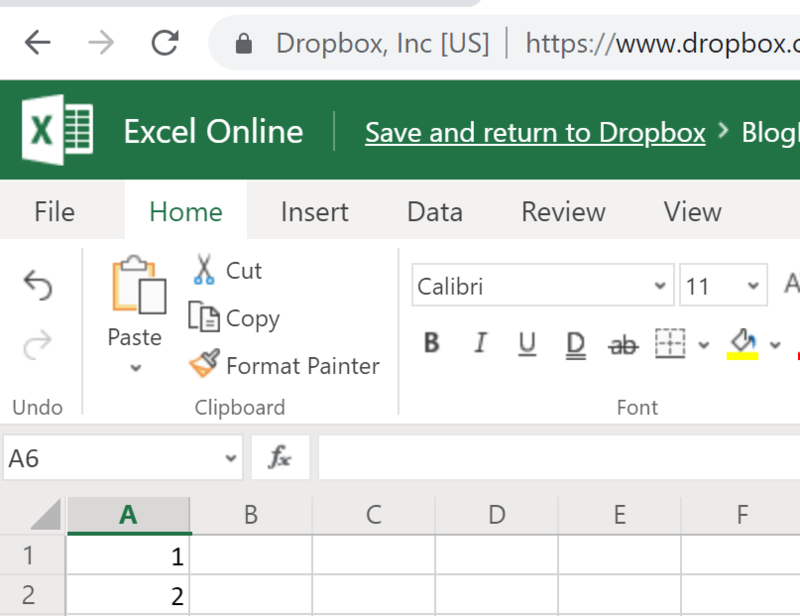 Dropbox offers two possibilities to collaborate: (a) co-authoring via Excel online (the recommended solution) and (b) working locally with your Desktop version of Excel. Here, collaboration is assisted with the blue round Dropbox badge that attaches itself to the right hand side of Excel. Now, you don’t have any other possibility than manually merging these two versions of the file. If you want to prevent this to happen, Dropbox recommends to drag the file outside of the Dropbox folder so only one person can work on it at the same time. Once you’re done, drag it back into the Dropbox folder. This essentially is how you can use the file locking mechanism with Dropbox. 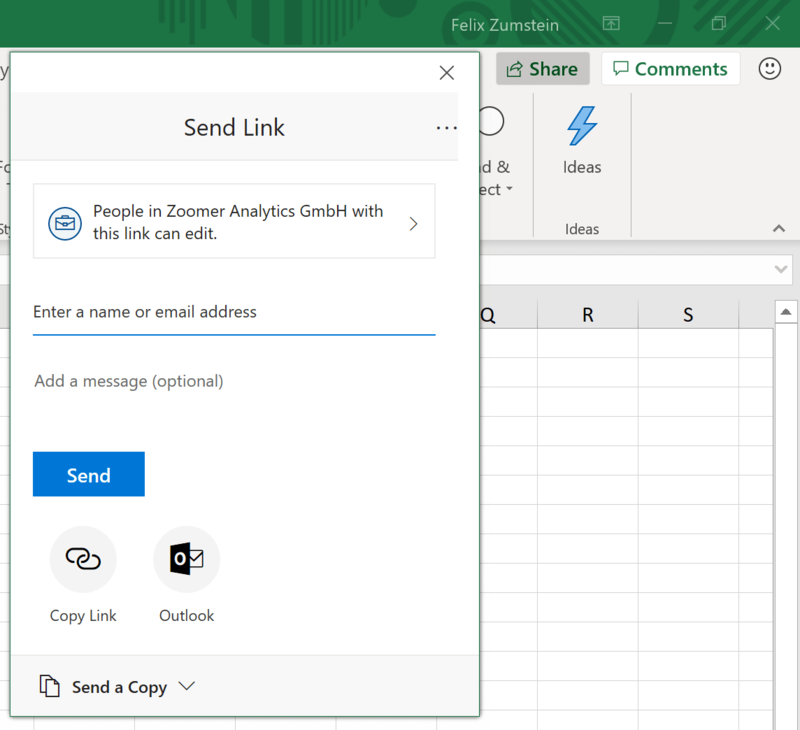 The co-authoring feature will only work if the person you’d like to collaborate with is a member of the shared folder in which the Excel file is stored. While Dropbox offers a version history, it only goes back 30 or 120 days (depending on your plan), which makes it unusable as an audit trail. Co-authoring is only supported in Excel online, not with the Desktop version of Excel. Dropbox and Microsoft Online integrate well for co-authoring Excel files online. The blue Dropbox badge is an attempt to ease collaboration when using the Desktop Excel apps, but it’s only likely to work when only a few users commit a few changes or you will have to resolve a lot of version conflicts manually. Box has the same options to co-author an Excel file with Excel online as we saw with Dropbox, so we’re skipping this part here. The special thing about Box is that it also offers file locking. Let’s get right into the details! You can also directly lock/unlock a file in the Box Sync folder by right-clicking on it. 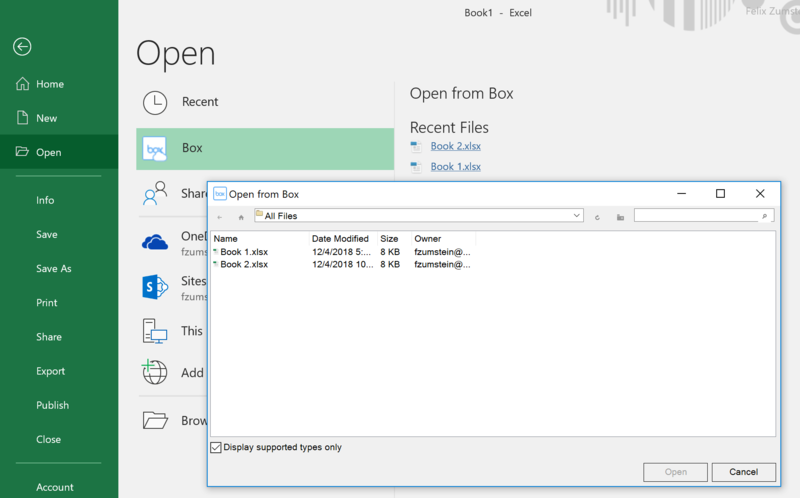 If you like the way a standard Excel file behaves on a shared drive but prefer to use a cloud solution, then Box’ file locking might fit the bill. With Box, it is also possible to keep an unlimited number of versions, but only if you use Box Governance.